Pronar at Farm-tech in Kenya - Pronar Sp. z o.o. African markets are fast-growing markets, which means a huge potential for business, including the agricultural sector. 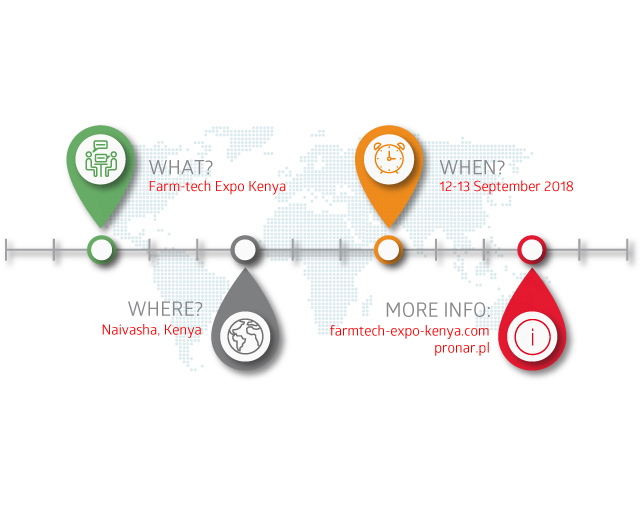 Therefore, Farm-tech Expo will take place in Kenya September, 12-13, 2018. It is an event that aims to introduce innovation to Kenyan agriculture and, according to the organiser, to introduce it into the 21st century. Pronar, consistently implementing its strategy of expanding its markets on all continents, will present its offer there. Over 4000 professionals from nearly 100 companies, from Kenya and from other parts of the world – including Poland, represented by Pronar – will appear on the area of 15 thousand m2. According to the organizers, the profile of visitors will be very different – from small and beginning farmers to owners of large areas, local and foreign investors, dealers, international suppliers or representatives of the government and ministries. The idea of the fair was inspired by the twin event, which has been taking place with great success in Zambia for four years. Farm-tech Expo Kenya will be a platform for meetings of participants from various fields of agriculture, intermediaries, machine dealers and farmers themselves. The latter will have an opportunity to get acquainted with the latest technologies, which will increase the productivity of farms.